User Interface Software Executes Honeywell TPA-100 Test Sequences and ATE Unit Software. 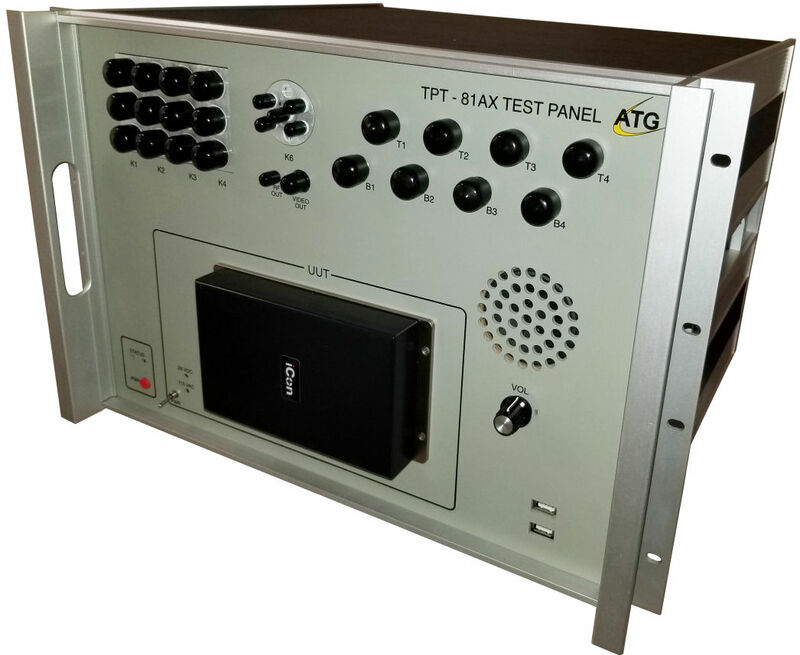 TPT-81AEX works with Existing Peripheral Equipment (RGS2000, RGS2000NG, Oscilloscopes, and Power Supplies). One Hundred and Seventy Six (176) Open/Common Discrete Outs (Individual Common Strap Every 4 Discrete Outs). Sixteen (16) +12V/Open Discrete Out. Sixty Four (64) Avionics Discrete Inputs. Twenty Four (24) 429 Receivers. Fourty Two (42) 429 Transmitters. Two (2) GPS PPS Outputs. Virginia Panel Connector to Interface with Cooling Tray Assembly. Front Speaker with Volume Control. Analog to Digital Converters (Headphone, Speaker, Test Panel Voltages). ATE Line Connector (Rear Panel). UUT AC/DC Fused Input Connector (Rear Panel). Coaxial N Type RF Switches (Expansion Box) with Internal and External (Rear) Control. Coaxial SMA Type RF Switch (Expansion Box - Spectrum Analyzer). 28 VDC Control Connector (Rear). 115 VAC Voltage Control Connector (Rear). Can be Executed from Internal or External PC. Compatible with Windows 10, 7, and XP. Windows Service (Internal PC) Provides Interface between User Interface and Hardware I/O. Test Panel Controlled via Standard Ethernet Interface. Embedded GPIB Controller for Internal Test Execution. User Interface Allows GPIB Control of AC Power Supply Voltage. 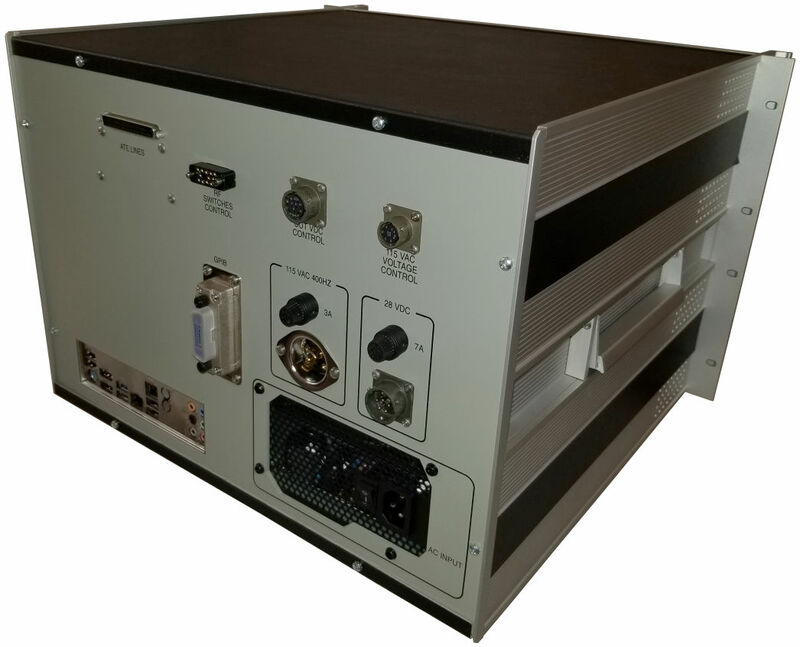 TELI Interpreter (Future) to Allow Testing of TPA-81A, TRA-67A, Control Heads, and Displays. VNC for Internal Operation and Testing without Attached Monitor. Embedded Antenna Simulator (Honeywell, Collins, and ACSS) to allow Unit Troubleshooting without RF Generator (RGS2000 or RGS2000NG). Front Log Detector Output and Coupled Output (50 dB Attenuation) of Selected Antenna Port. Two (2) USB 2.0 I/O (Front), Four (4) USB 3.0 I/O (Rear), and Two (2) USB 2.0 I/O (Rear) for HID and Flash Drives. Two (2) Ethernet Ports (Rear). HDMI and DVI Output for Test Software Monitoring. TPA-100/TPA-81A Cooling Tray with Six (6) Feet Wiring Harness. 115 VAC 400 Hz Cooling Fan. Eight (8) N Type RF Bulkhead Connectors (Rear) for Antenna Port Connection. Eight (8) N-N RF Coaxial Cables for Cooling Tray to RF Test Set Connection. TPA-100/TPA-81A Log Video BNC Bulkhead Connector (Rear). TPA-81A Dataloader Cable for Cooling Tray to TPA-81A Front Connector.